The Etosha National Park in the north of Namibia offers some of the finest wildlife viewing in Africa, and is one of the undisputed highlights of a visit to the country. The vast desert landscape of Damaraland is one of the most beautiful regions of Namibia. Surrounded on 3 sides by the Namib desert, and on the 4th by the Atlantic Ocean, Swakopmund is an interesting blend of African and German heritage, and one of the most friendly towns in Southern Africa. The Skeleton Coast gets its name from the huge number of shipwrecks that have happened on this treacherous shoreline over the centuries. Highlights, suggested itineraries, and recommended places to stay. Namibia brings a whole new meaning to the idea of getting away from it all. An epic land of shifting orange sand dunes set against brilliant blue skies with fascinating traditional cultures and world-class wildlife viewing, it occupies a league all of its own. If you're looking for an alternative African adventure across a remote and beautiful untouched wilderness, Namibia is an unbeatable choice. With one of the lowest population densities in the world and sparse, quirky pockets of German colonial culture, Namibia gives you a feeling of grand emptiness found in very few places on the planet. Here, you can drive for hours and encounter only a couple of cars on the road, making you seem magically and wonderfully alone in barely-discovered Africa. Famous primarily for the staggering 'Dune Sea' of Sossusvlei and the wildlife-filled Etosha Pan in the north, Namibia is a land of startling contrasts and incredible landscapes. Home to the rare desert elephants of Damaraland, the shipwreck-riddled Skeleton Coast and the far-reaching vistas of the Fish River Canyon, there’s a series of unusual surprises in store for travellers that make it to this amazing nook of Africa. Suffice to say that Namibia is far more than a holiday destination - it’s somewhere really special that is guaranteed to leave you wide-eyed and open-mouthed. A surreal sea of ever-so-slowly moving sand dunes, Sossusvlei needs to be seen to be believed. 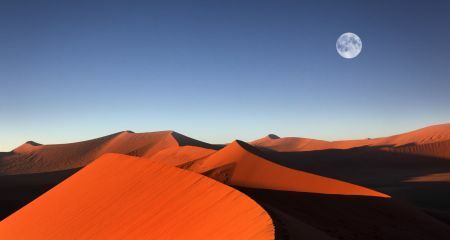 The dunes are Namibia’s most famous icon, with their scorched orange sands standing in stunning contrast to the rich, blue skies. Watching the sun rise over the dunes, sending shifting shadows across the land, is a sensational experience that will stick with you forever and there’s a huge assortment of dune-based activities available in Sossusvlei, including hiking, scenic flights and sunrise balloon flights. 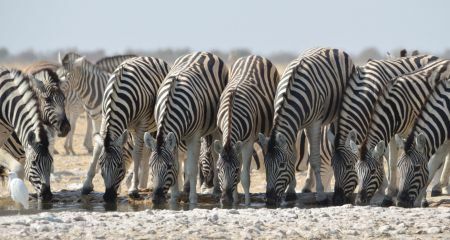 Etosha is an exceptional wildlife destination. Centred around a huge white salt pan filled with vast herds of roaming elephant, zebra and giraffe it’s an unrivalled, remote wilderness for a breathtaking safari. Here, you can grab a series of game drives to really remember as you scour the savannah for signs of wildlife, passing bizarre 'upside-down' moringa trees and cracked salt surfaces en-route. Etosha offers some extraordinary lodges that perfectly compliment the landscape, from secluded tented camps with far-reaching views to sleek, sophisticated luxury lodges in surreal scenic spots. A region of stark, remote beauty, Damaraland is home to rare desert-dwelling elephants and free roaming black rhino. An astonishing assortment of far-reaching desert vistas, hazy mountains, traditional villages and extraordinary bushman engravings, Damaraland has a jaw-dropping jumble of attractions of offer. Seldom-visited, it’s wholly serene with some spectacular places that don’t even have names! Here, you can explore truly untouched Africa and even track rhino on foot, so if you’re after an eye-opening adventure, you can’t do better than Damaraland. If you’re in the process of planning a trip to Namibia, our practical online travel guide is full of handy advice, including passport and visa requirements, a useful guide to driving in Namibia and what to expect from the weather at different times of year. We highly recommend delving into this information before setting off for the Namibian horizon. Of course, if there is anything at all that you can’t find in our Facts for the Visitor section, please do not hesitate to get in touch. We’ve driven across Namibia ourselves and we’d be delighted to help with any questions that might crop up.